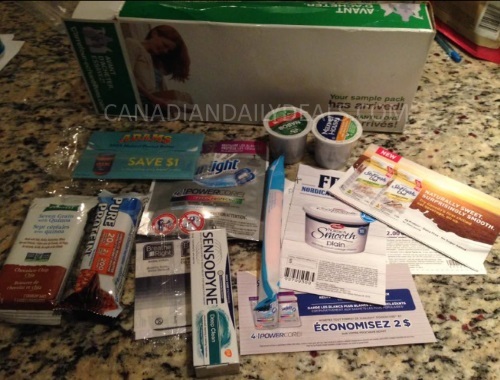 Canadian Daily Deals: Great Mail Day Samplesource Free Fall Sampler Pack but disappointed! Great Mail Day Samplesource Free Fall Sampler Pack but disappointed! I received my Samplesource Free Fall Sampler Pack in the mail. Actually I got it Friday, but I didn't blog this until today. Some people are still waiting for their boxes so I figured it was worth posting anyway. Anyway, I gotta be honest, I was disappointed with this season's box. As you all know I stalk the heck out of the Samplesource website, waiting for it to go live so that I can tell you all to GO GO GO and order. I got my order in moments after 9am ET on the morning it went live, I was probably one of the first people to get it through I was up all night (I always do this on a launch day) waiting. I was offered 14 samples when I ordered, I made a note of this on my original post here. Great right? Well I didn't get many of them, continue to read below. Don't get me wrong, I am happy to get any samples and I've been ordering and receiving Samplesource sampler packs for many years now, but I am confused by all the missing samples. I noticed many readers were getting boxes with missing samples too, or samples that they did not chose to receive. What's the point of doing a survey if they just pack the sampler boxes with whatever is left over? Of course there were other items that I was not offered that some other people got too (such as Temptations treats or the dog samples (I don't have a dog so this did not apply, Sensodyne mouthwash and other items). Also, when you order doesn't seem to make a difference either, the samples run out as time goes on, but once you get your box you might get less than people who ordered near the end. Please note, Samplesource Fall Sampler packs are no longer available, the next sampler round is the spring, read over our Samplesource FAQ post here. Still waiting for your Samplesource box? Click here for info on how to track your order. What did you get in your box? Was it all that you expected? Please let us know on our Facebook Page here. Hi.. Im in Alberta.. and actually... thats also exactly what i got.. along with sensodyne toothpaste and mouthwash samples... soooo sooo disappointed! Sure not what I expected either!! Sure not much to it... thumbs down!! sorry to hear that you didn't get what you expected..I'm still waiting for mine! Was a bit later getting online when the samples went live, but I did get the Vector Protein bar, and just checked the coupon for the SoFresh Oat beverage and you are right - it is already expired. Perhaps it was meant to say Oct 31/18. It was certainly not as exciting as other years. Samplesource dropped the ball with that coupon. But readers have mentioned how they contacted the company (of the so fresh beverage) and are getting replacement coupons, so definitely try that if you want it. Be happy. What you get is determined by your profile and answers to questions. You don't get everything automatically. I got my pack and am very, very happy and satisfied. I am happy for getting what I got, but you missed the point. What I got was absolutely not determined by my profile and answers that I gave, as I said I was offered x amount and did not get that. You should feel blessed that your job is to get free stuff. Free is free. Your review is very "first world problems"
My job is to get free stuff? That is the funniest comment of the year! That would imply that I actually make a living from this blog, that is far from the truth. Your comment is very uninformed and assuming. I still haven't received mine. So time will tell. I got dog food samples, I don't have a dog. I didn't say I had a dog on the survey. This time around what you got was most definitely not based on the profile/survey questions that you gave! I got almosteverything I was offered. I got the V8 +ENERGY® Peach Mango drink and a Vector* Protein BAR. The only thing i didn't get was the coupon for the SoFresh, but sounds like it would have been expired anyways. I received my box and am very thankful, but the coupon for the So Fresh Oat milk substitute exspired Oct 31/2017. You only get less than a week to try and find the product let a lone try it? This annoyed me as I don’t drink cow milk. Why give a coupon if it expires in a few days? I had the same thing happen, did you try contacting the company to get a replacement coupon?